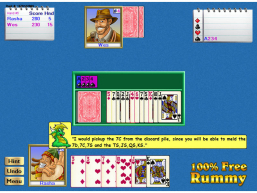 100% Free Rummy is, as you probably guessed, a Rummy card game for your desktop. 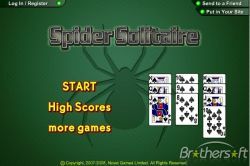 It’s a simple download and a lot of fun, if you know how to play the game. And even if you don’t, there are very helpful, animated tutorials at the beginning of the game. 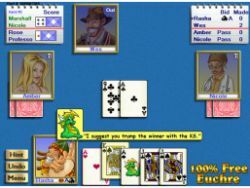 All of DreamQuest Software’s free card games are very accessible for beginners, but with equally challenging AI for the experienced player. You can choose your difficulty level and the AI players act accordingly. To play with other, real people, you have to create an account. I always just sign is as a Guest, to save time. But these games are designed for players to create individual profiles, if they wish. 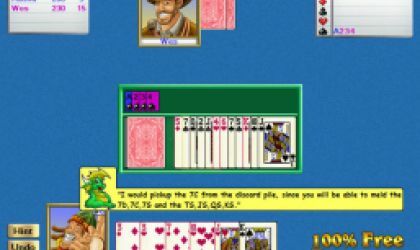 Unlike other free card games, you can actually use the “Hint” button without having to subscribe to any website, or upgrade to a pro version. It’s a good tool for new players that are having trouble grasping the rules. 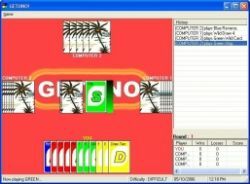 There’s not much to this download, so it’s easy to open and play and then leave when you need to. 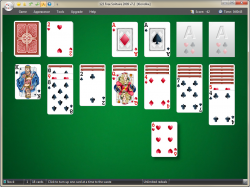 If you love Rummy, but you can’t find two or three more people to play with, this is an ideal download.